Tis the season for sparkle and the perfect time for a mini course on diamonds, how they are graded, different types of laboratory certificates and some guidelines to make this â€œjourneyâ€� less confusing. Basically there are the four Câ€™s plus the last, equally important, confidence in your place of purchase. 1-Cut of the diamond: Refers to the shape and also how the proportions and polish affect the brilliance of the diamond. A round brilliant has the most definite parameters regarding measurements, cut, polish, etc. and is the most costly of all the shapes. In the past few months, we saw a large increase in the price of diamonds, especially in rounds. If you are not definite on a round, consider another shape. You may find a larger stone, better quality or both for the same dollars spent on a round. 2-Color of the diamond: The highest color is the complete lack of body color; no tones of yellow, brown or gray. Years ago, this was referred as a â€œblue-whiteâ€� diamond, but the current grading system uses letters from D-Z, with whitest diamonds from D-J with D-E being the best and lower letters having slight body color. This color is not necessarily easily discerned to the eye, but it will affect the value and the brilliance. 3-Clarity of the diamond: This sounds daunting, but hereâ€™s the quick definition. Can you see any inclusion (crystal) , line (feather) or cloudiness within the stone with your naked eye? If nothing is visible with the eye then when magnified under 10x how many characteristics (inclusions) are visible? Clarity grades are: Flawless, Internally Flawless, VVS 1/ VVS 2, VS 1/ VS2, SI 1/SI 2 , I 1, I 2. etc. Regarding characteristics visible under 10x power, Flawless has nothing visible, VVS has minute visible, VS has minor visible, and SI has obvious visible. So, without a microscope a SI1 diamond will look the same as a Flawless diamond, given color and cut are of equal quality. The most popular combination is a SI stone with D-H color. 4-Carat Weight of the diamond: Standard unit of weight for diamonds and gemstones. (This is ct. not kt., which refers to karat gold.) There are 100 points in 1.0 carat stone. So, a Â½ ct. is .50ct, Â¾ ct. is .75ct and so on. Confidence: Be certain whomever you purchase the diamond from can explain why the diamond is graded as it is. Many diamonds have a laboratory report that comes from an independent grading lab. Frequently, we purchase diamonds that have reports, but we always examine the diamond first to see if it meets our criteria. The report means someone else graded the diamond prior to its sale to the retailer. The most popular laboratories are GIA( Gemological Institute of America) and EGL ( European Gemological Laboratory). GIA set the standard for grading and assigned the new system stated above for color and clarity. EGL is world wide with labs in NYC, Belgium, and Israel. Grading ultimately is subjective so my rule of thumb is simple. Can the person selling the diamond explain why it is graded as it is? If they canâ€™t or try selling it using only the certificate, Iâ€™d have second thoughts. Arenâ€™t you paying for the expertise of the place you are buying it from as well as from the lab? 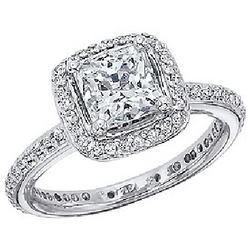 At Dianaâ€™s, we provide a complete replacement value appraisal on pieces we sell which includes diamond and setting.